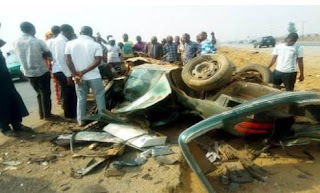 At least 28 people made up of teachers and students of the Command Junior Secondary school, Misau, Bauchi state, were on Tuesday, February 13, crushed to death by a trailer in a fatal road accident in Gaya local government area of Kano state. Daily Independent reports that those involved included three teachers and 25 students and that they were in a commercial Toyota vehicle travelling to Gidan Dan Hausa in Kano state for an excursion to one of the FM stations when they had a head-on collision with the trailer. It was learnt that the vehicles conveying the students and their teachers was trying to avoid a pot hole at Tsamiya Uku village near Gaya Kano state following which it ran into the articulated vehicle. “Today is a tragic one as we lost about 23 of our best young minds, students and teachers of Command Junior Secondary school, Misau who were returning from an excursion journey from Kano state. “May Allah Almighty grant them Jannatul Firdaus and comfort their families. It is not good for a society to bury its young, worse still, when they go in search of knowledge. “I offer my condolences to all affected and the people of Bauchi state,” the governor said in the personally signed statement. Former senator representing Plateau Southern, retired General John Nanzip Shagaya, reportedly died following a ghastly motor accident on his way to Jos from his hometown, Langtang. Multiple reports confirmed the incident quoting family sources as saying the incident happened on Sunday, February, 11.